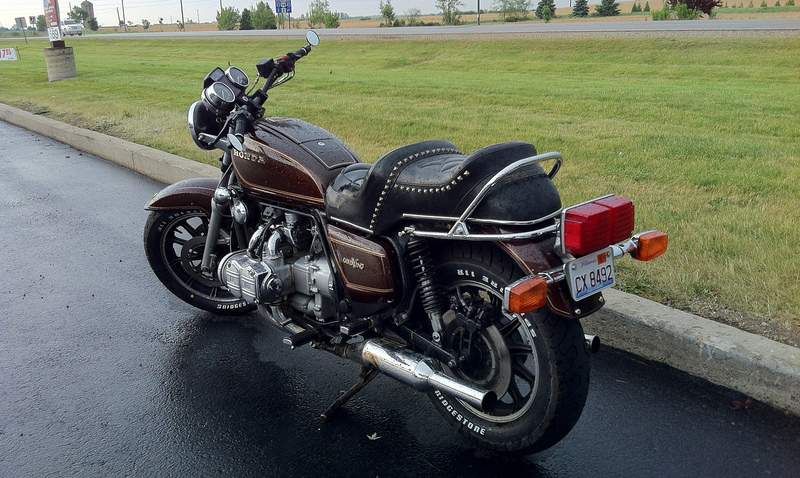 Once my CB450 came on the scene, I was spoiled for riding choices. Between my Elite 250 and the 450, I didn’t have to rely on the GL any longer for having something to ride. 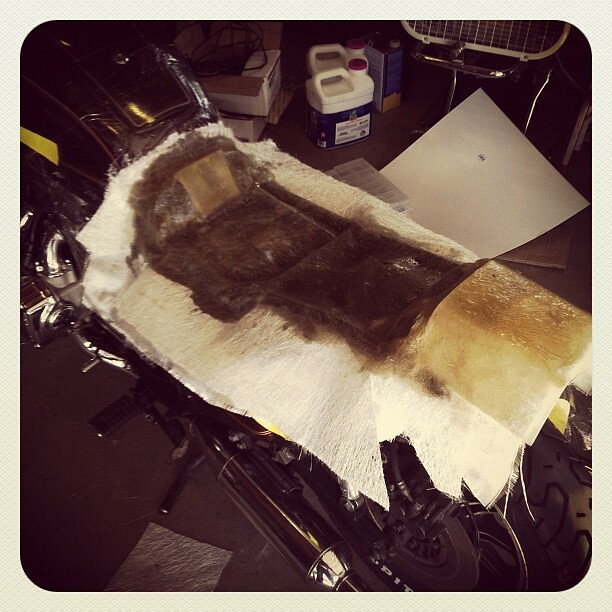 This opened up the opportunity to start making one of the changes I have in mind for my own naked Goldwing project: the seat. 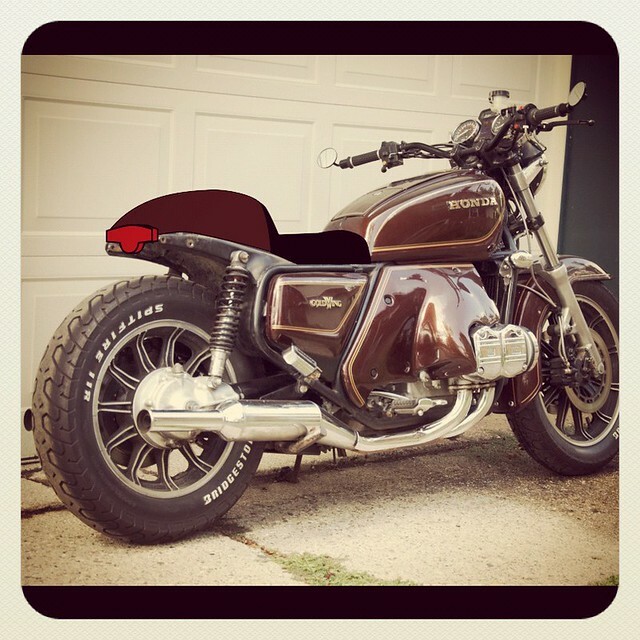 It’s not really a cafe seat, but it’s more of solo seat with a rear fender delete. The real appeal for me in this approach was how much it works with the bike’s frame. I felt like I only landed on a good concept after I quit fighting the frame — quit trying to make the bike be something it wasn’t. 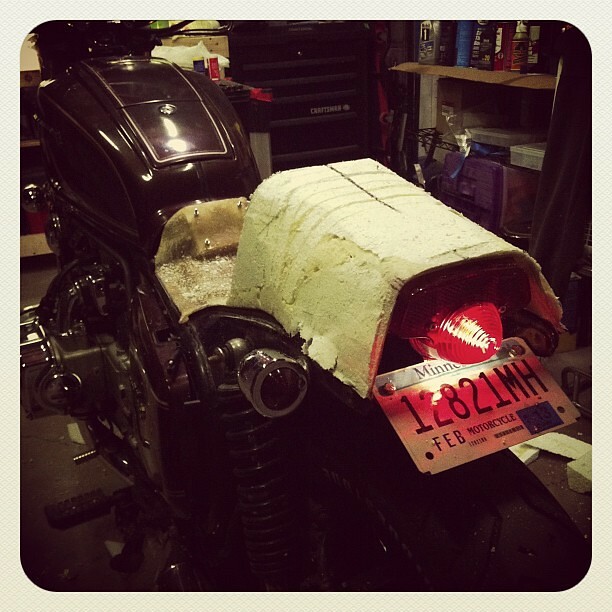 I had a euro-style tail light, and all along I’d wanted to do some sort of tail hood that I could tuck it into. 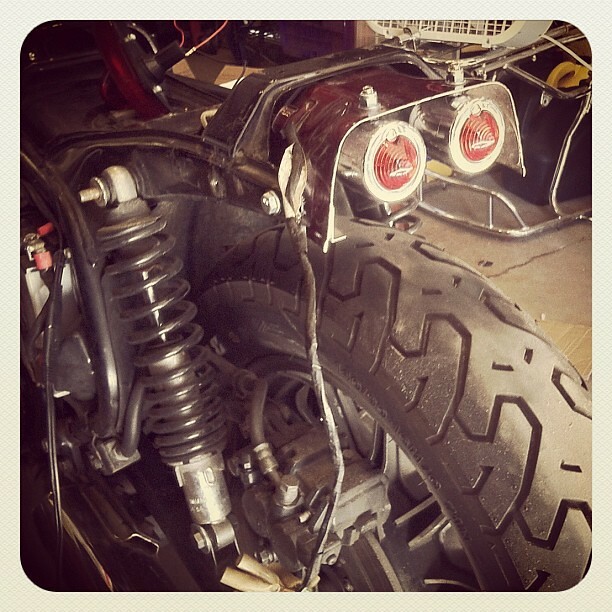 I also had two more chrome bullet lights to match my frame-mounted front turn indicators. With a basic idea in mind, I started modifying the stock seat pan. The problem with the stock pan is that it doesn’t follow the frame very closely. If I wanted a nice, low-profile seat, I’d have to fill in the space then enclose the bottom in fiberglass. Because I didn’t have any better idea of how to fill in that space, I simply laid plastic wrap down on the frame and pumped the gap full of expanding foam. The results were pretty good. That much expanding foam takes a good 24 hours to really cure hard enough to work with, but it definitely fills in the space. Glassing it in was remarkably easy. The key technique I learned in these early explorations was just how well kitchen plastic wrap keeps very sticky things off the motorcycle, but lets them form very closely to the frame. 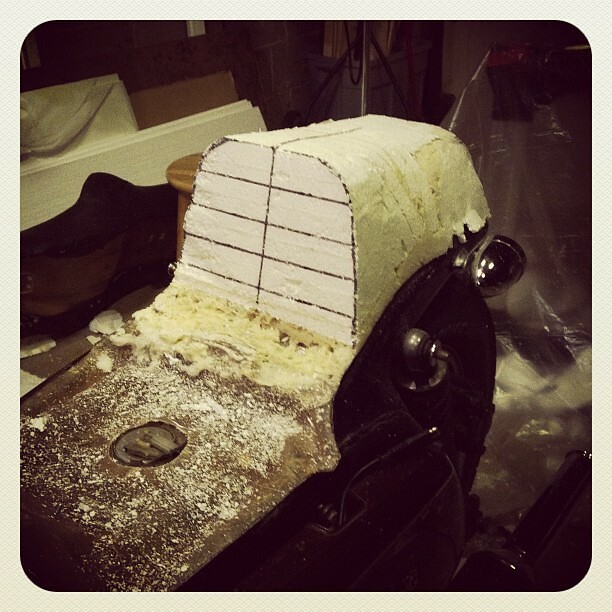 Before I could really put together the final shape of the upper seat and fender. I had to sort out the hood for the tail light. Going back to eBay, I found a GL fender for about $25, shipped. This meant I could play around with chopping a fender, but without sacrificing my stock components. I wanted to be able to put the bike back together and ride it as stock if I needed to. 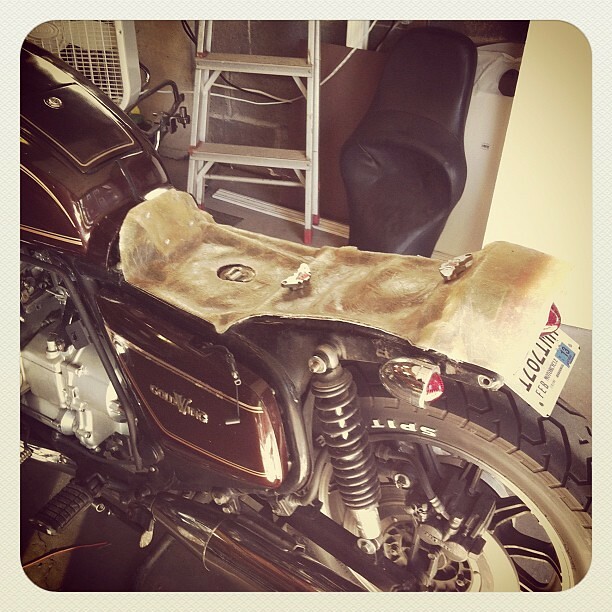 Not because I would ever want to un-costomize the bike, but so that I can still ride it as needed while I work on it. 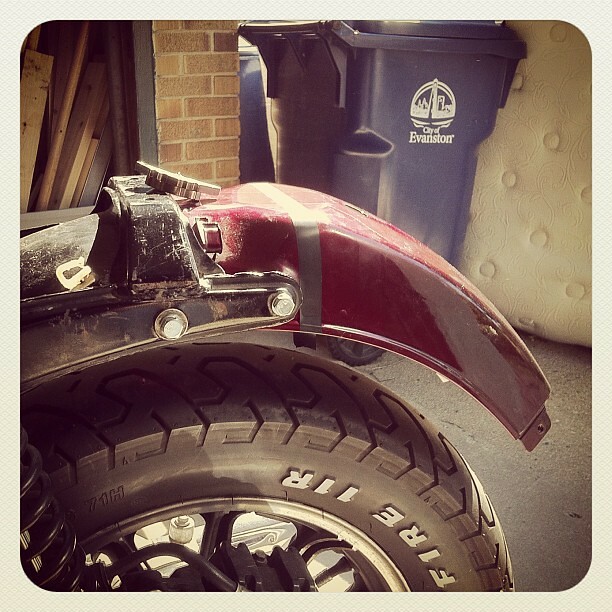 With essentially a disposable fender, it didn’t really matter if I screwed it up. Optional failure. I also found that this kind of “try it and see what happens” attitude was completely liberating. I was able to grab my side grinder and just tear into that fender. Chop chop. 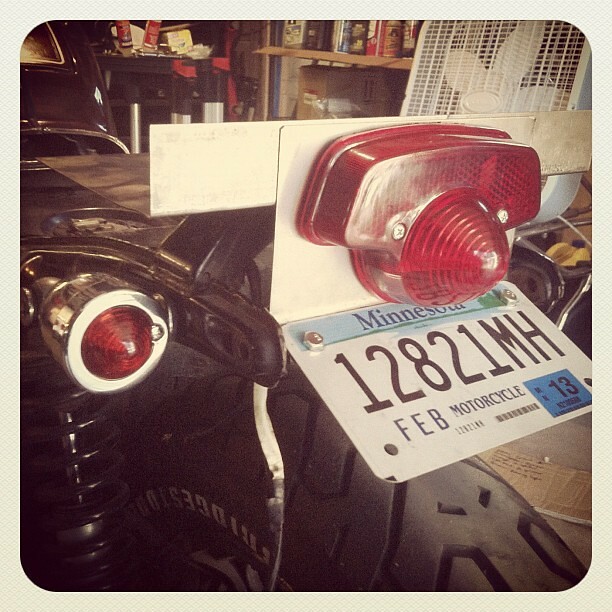 While I was there, I had an idea for an alternative tail light assembly. 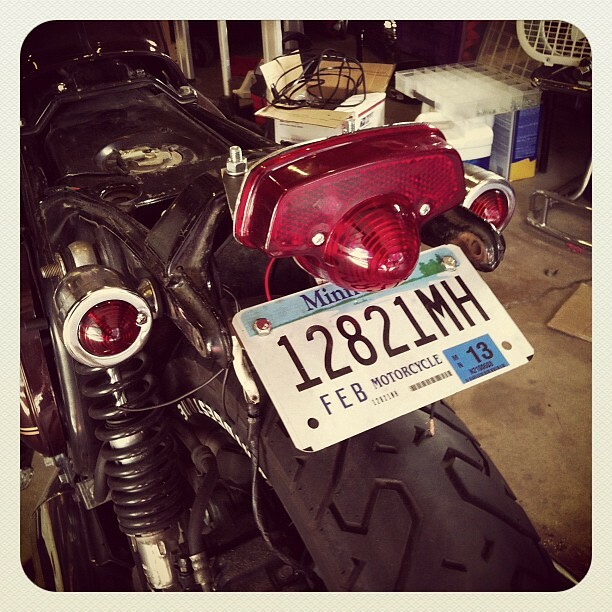 I bolted in my two bullet lights, knowing that I could always wire them up as both brake lights and turn indicators. I didn’t hate it, but it was just too clever. It was trying too hard to be a quirky detail — asking for too much visual attention. That’s fine though. Nothing ventured, nothing gained. Putting my euro-style tail light in that same spot presented a problem. The light was too tall for that spot. I’d easily nail it with the tire on a good bump. So I used the bobbed fender as a positioning aid. The height was good, and it let me also try mounting the turn signals in the OEM seat bolt holes. The height also gave me the idea that I could suspend the license plate under the euro light and take advantage of its down-shining light. With a basic layout established, it was time to do some real fabrication. The first item was working out longer mounting bolts for turn indicators. 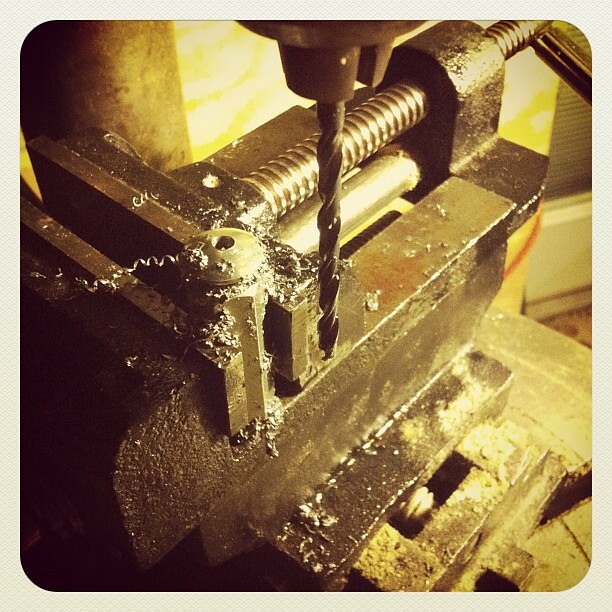 The bolts it came with aren’t long enough to pass through the frame as is, and while 5/16″ carriage bolts are easy enough to come by, drilling a hole down the exact center of a bolt (for the wires to pass through) is not as easy as it sounds. I ruined six bolts before I got two I could use. 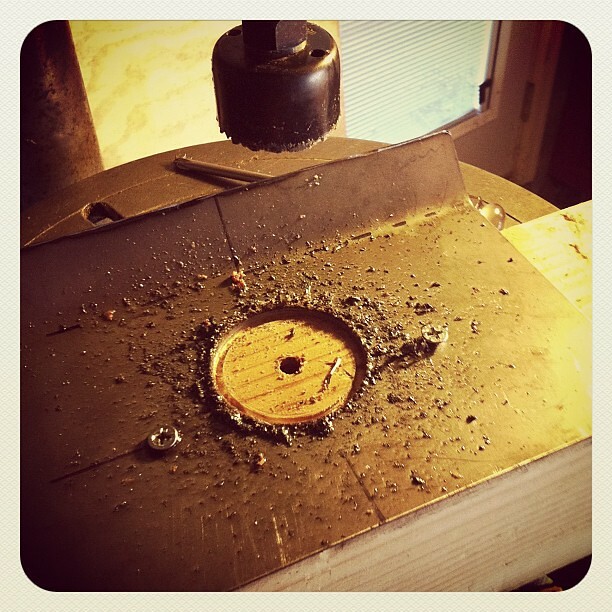 It was a lot of learning and quality time with my drill press. 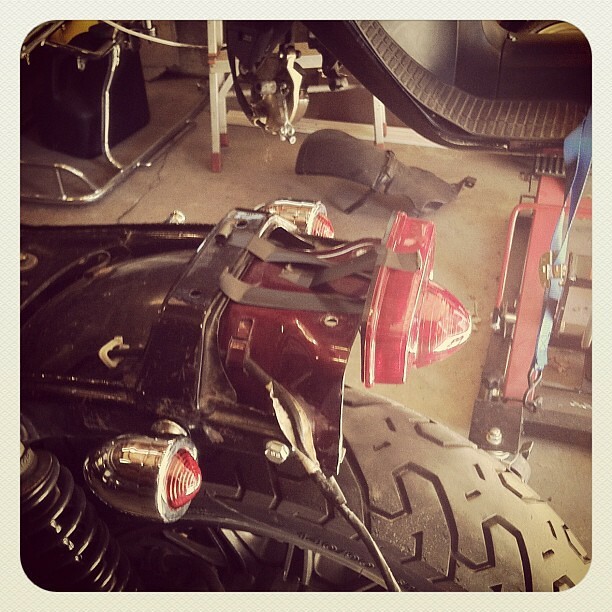 My next challenge was to figure out some way to mount the tail light to the frame. For some reason, there are two holes in the cross member that supports the passenger seat. There’s nothing that actually bolts into them, yet there they are. So I decided to tie into them using some 22-gauge steel. This would be my first real experience fabricating with steel, an I have to say, it’s fantastic. It was just a couple of bends and a few holes, but the precision that the steel affords is terrific. I’d gotten really comfortable with fiberglass by this point, but steel is even better. I built the bracket in two parts so that I could independently adjust both depth and height. While I wasn’t thinking of this bracket as a prototype at the time, it turned out so good, I didn’t see any reason to remake it. An integrated license plate holder set the plate at what is hopefully just enough of an angle to keep any police from hassling me about it. 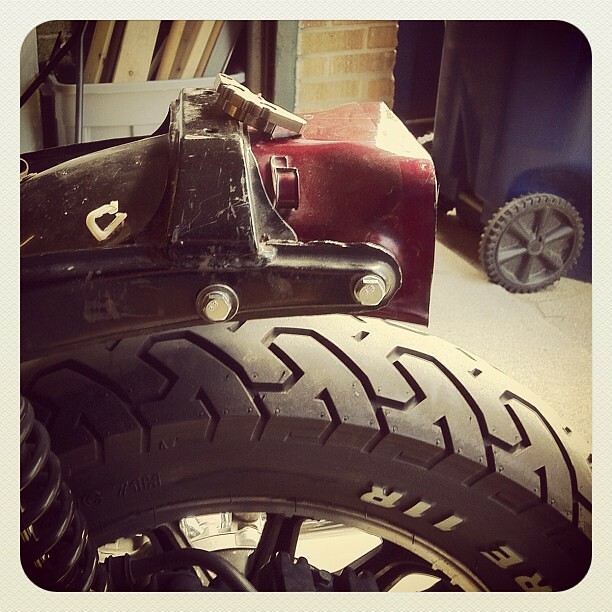 With no rear fender intended for this bike, the plate has to go somewhere. I’m not really a fan of the axle or shock mounts that place the plate vertically off to the side of the bike, simply because it’s asymmetrical. I’m obsessive that way. With the light’s location set, the real question now was what the final shape of the rear section of the seat: the cowl. The exact seat shape and how it would play into the cowl were still up in the air. Instead of more photoshop explorations, I decided to get in touch with some old skills. I have an art degree, after all, but it’s been a really long time since I sketched regularly. 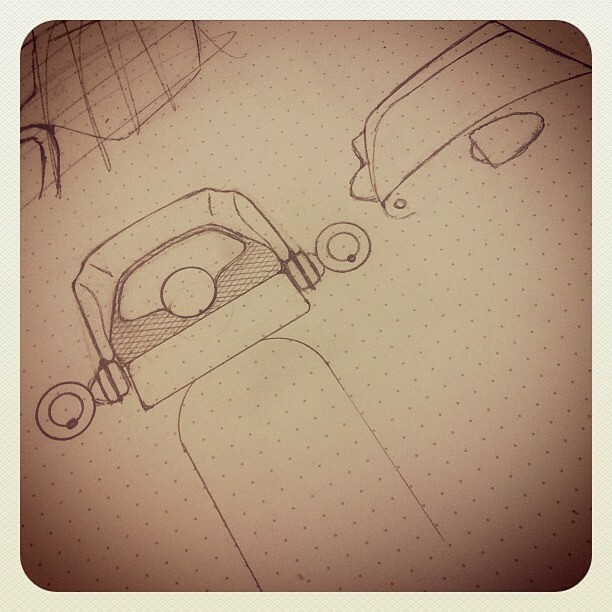 As I did more and more sketches, the shape and style of the cowl became more and more clear. The trick now was figuring out how to build it. A clearer vision and lots of experimentation with my modified stock seat pan had me on a new path. The stock pan wasn’t fitting the way I wanted it to, and I realized that it would be a shorter path to something good to just craft my own pan than to continue to modify the stock one. So with plastic wrap laid over the frame, I layered up three layers of fiberglass, then followed up with reinforcement layers in key areas. With the new lower pan trimmed out, I new I was onto something. I’d used poster board to support the fiberglass tunnel over the tail light. This seemed like a good idea at the time. What also seemed like a good idea was the use of two extra large rare earth magnets to hold the pan to the frame. The frame was so tightly fit to the frame, that the down force from the magnets seemed as good as a pair of bolts. So I glassed them right into the lower pan. Now it was time to create the actual cowl. I used styrofoam held together with 3M Super 77 spray and expanding foam. It started ugly to say the least. This was another case of simply forging forward with my best guess, knowing that I could always redo it if it didn’t turn out the way I wanted. A bit of rough shaping with my pull saw and some sandpaper had the shape starting to come together. 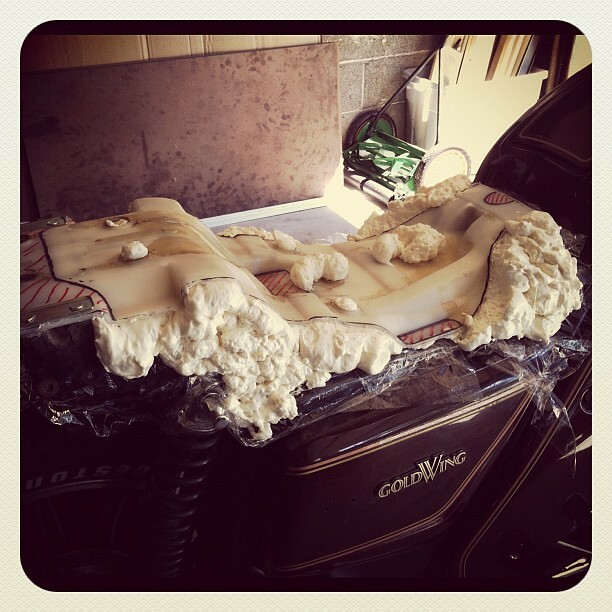 I learned yet another key piece of technique here: don’t mix your foam densities in the area you’re actually carving. 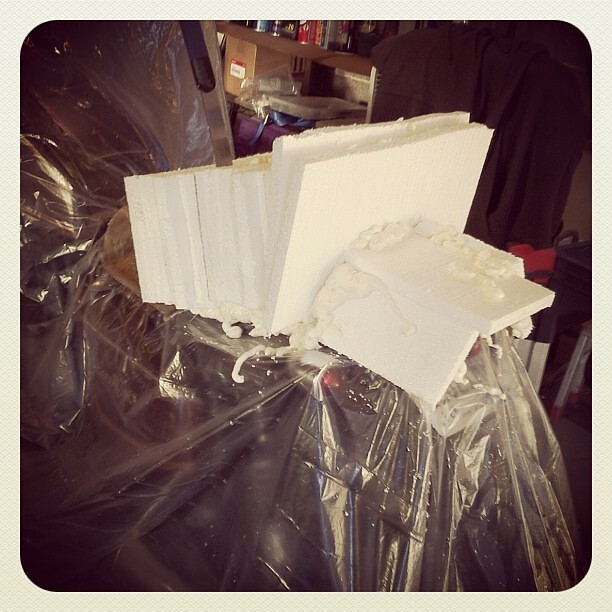 Going back and forth between the soft styrofoam and the more rigid expanding foam meant that getting a smooth, continuous surface was pretty difficult. Up to this point, I’d just been eyeballing the layout of the tail cowl. Using a laser and a t-square, I drew up a simple grid on the face of it and measured out consistent distances from center. This let me start to actually dial in not just the front shape of the cowl, but confirm the symmetry relative to the frame. The basic shape was there, but this let me finally dial it most of the way in. Before going any further, I paused to sort out the electrics for the new rear turn indicators and tail light. 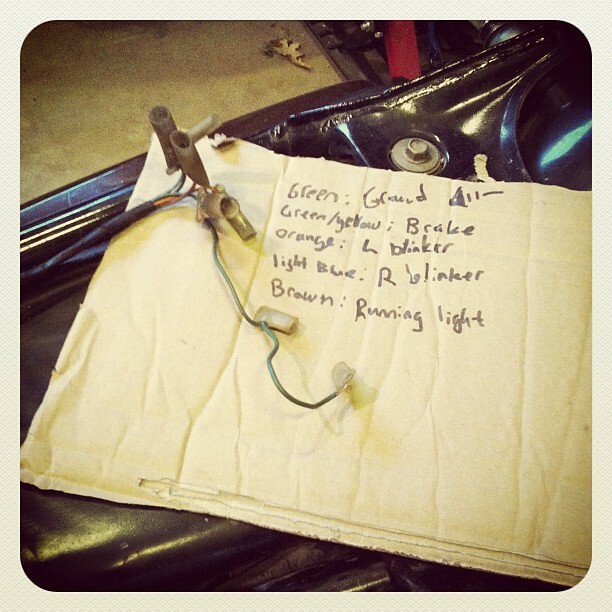 I snagged a replacement wiring harness on eBay so that I wouldn’t have to cannibalize the wiring built into stock fender and tail light assembly. This has been a priority all along this project: to be able to take specific components back to stock if needed. So throughout this seat and tail cowl fabrication I wanted to be able to put the stock seat and fender back on and be able to still ride the bike. Not tearing up the stock wiring was one way to maintain that. I grabbed my multi-meter and traced what wires went where, and that let me mock up the indicators, the tail light and the running light. Everything worked on the first try. Love it when that happens. 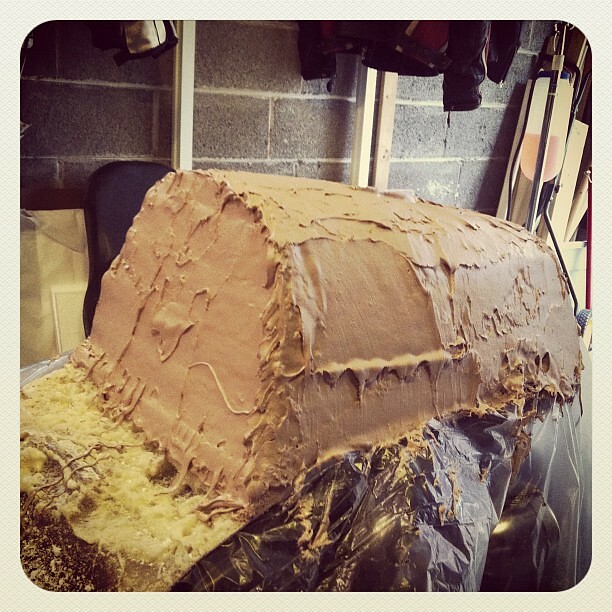 With the wiring sorted out, it was time to start working with the weirdest material of this whole process: Bondo. It’s really strange stuff, Bondo. It goes on like peanut butter and cures into something that feels like limestone in about 15 minutes. 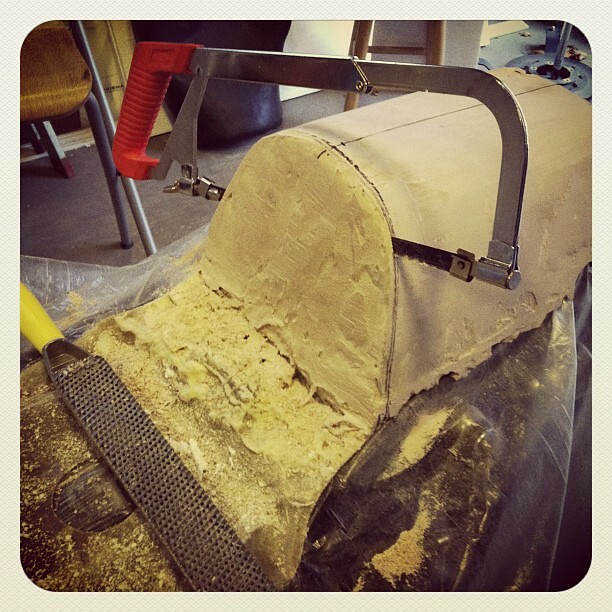 The plan was to use a thin layer of Bondo to create a solid surface into which I could carve a finer shape. Over that would go several layers of fiberglass. At least that was the plan. A quick rasping had the basic shape of the cowl started. I’d read that bondo dust is poisonous. 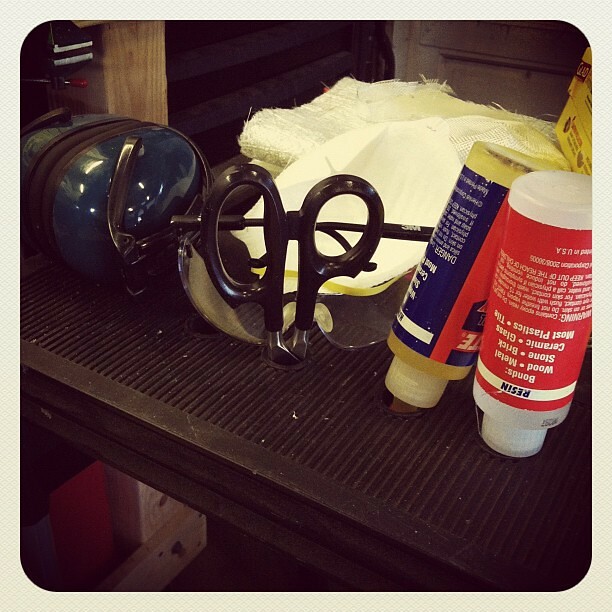 In fact, most of the materials I’d been using for this project were hazardous. 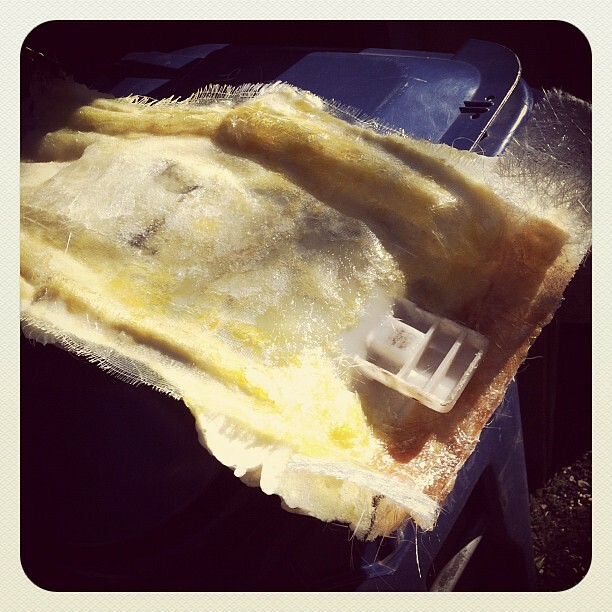 The fiberglass cloth fibers will dig into skin. Resin fumes are toxic, plus it’s very easy to develop an allergy to the stuff if you get it on your skin. 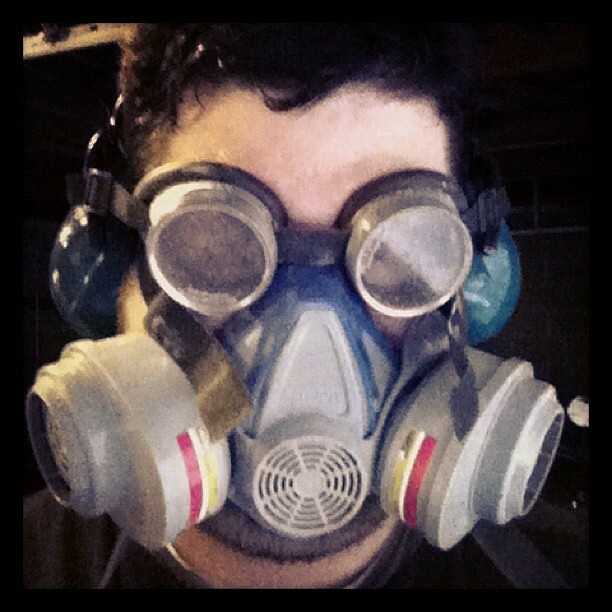 I’d already been using gloves and keeping things well ventilated, but with bondo in the mix now, I upped my game to include a respirator. 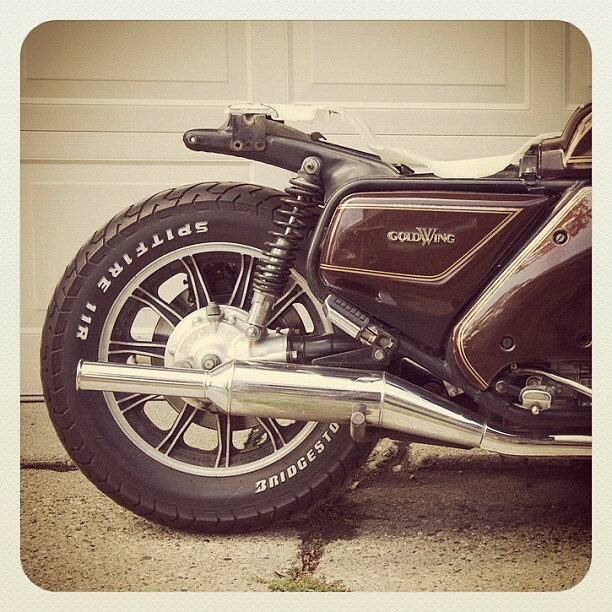 It’s hard to enjoy a motorcycle while one is dying of lung cancer or some damn thing. 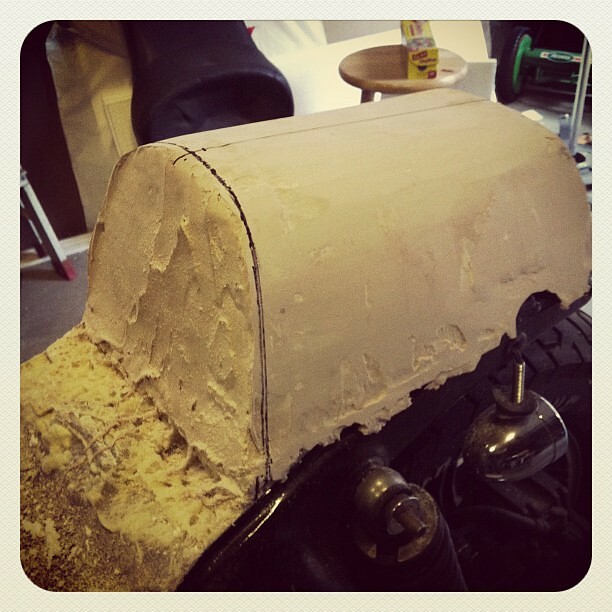 I tore into the bondo and roughed in the shape. 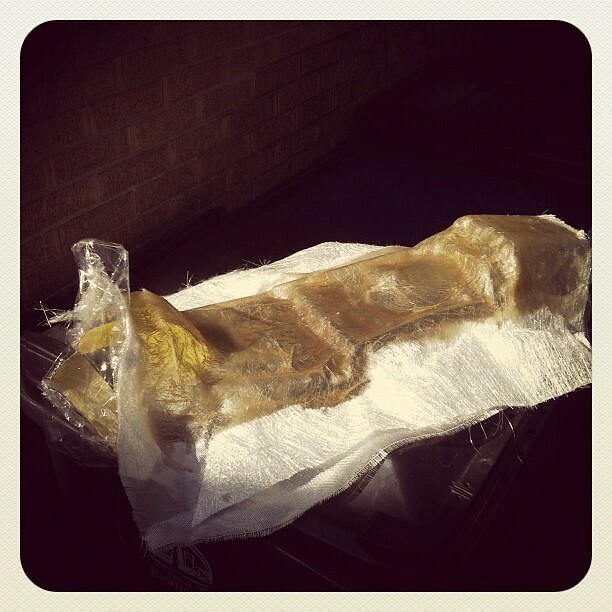 Unfortunately though, I’d bondo’d over my grid. 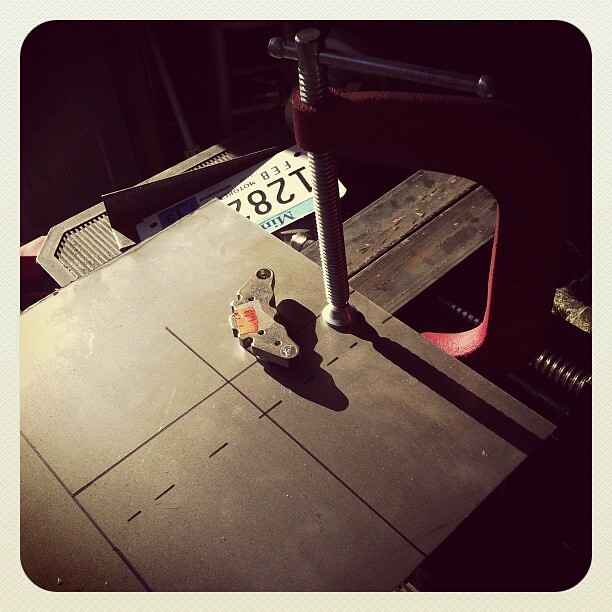 A quick exchange with the hack saw had me back to a flat surface where I could draw a new grid. This way I could judge the final shape more accurately. Back and forth. Back and forth. Let the saw do the work. Back an forth. Bingo. Using lasers and sharpie once again, I had a grid I could use to judge the shape of my cowl. 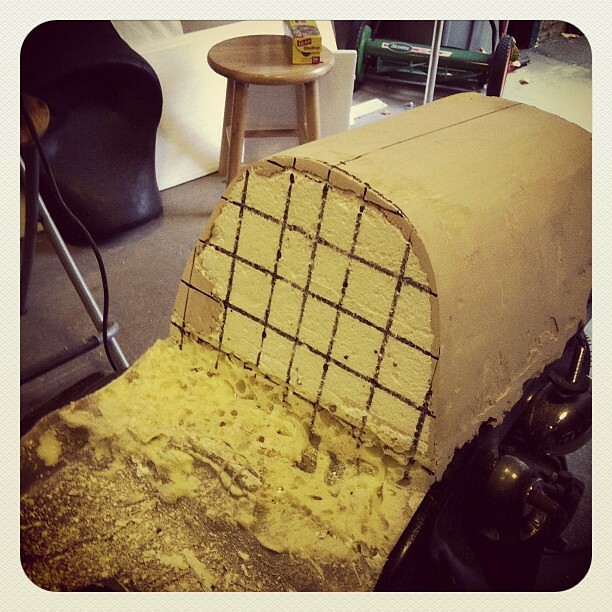 Of further interest was just how thick the bondo layer had turned out. Working back from this new front plane, I quickly roughed in the cowl’s shape back to the hooded tail light. As the curves and angles took shape, I encountered my second real failure of this project. The poster board tunnel I’d used to bear up the fiberglass wasn’t anywhere near as symmetrical as it needed to be, let alone as symmetrical as I wanted it to be. I thought that I’d be able to more or less “cheat it” using the relative thickness of the bondo layer. The back third of the underside of the cowl was useless, and with it, everything above it. Everything from the passenger hoop back would have to be redone. I’d have to cut off the rear end of the cowl like a rotten limb to keep it from ruining the whole thing. This was disappointing, but wasn’t this the process? I’d have to push forward and keep making progress. Thing is, it was fun. All of it, including the setbacks. 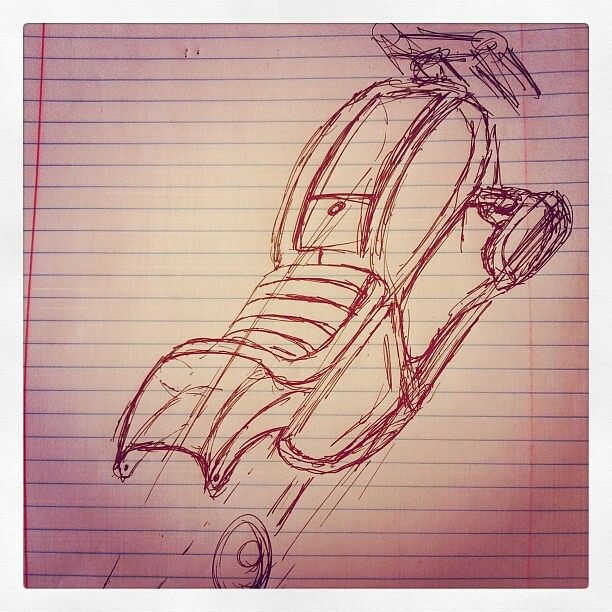 I was making my own way in this project on the way to making this big, goofy old motorcycle truly my own. 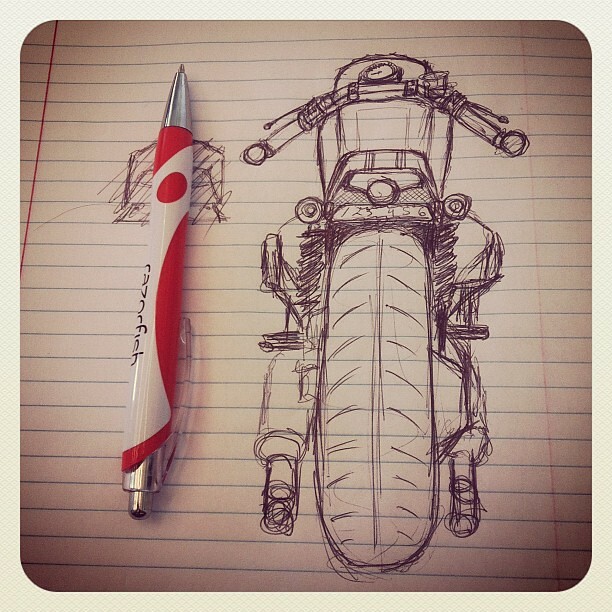 Just like riding this bike, when it comes to creating a custom seat and tail, to travel is to arrive. What doesn’t kill you makes you stronger. It’s fun to follow your process and the ride on the learning curve. That is how unique and creative work gets done. Keep on it! Send my greetings on to everybody at Scooterville! I’ve been following along vicariously with this project online through photos you’ve posted so it was nice to see the story more fleshed out in the form of long copy.